My good friend Michelle comes to my place every few weekends so we can study for the Literature GRE together…and drink tea together…and cook together. The following recipe was conceived on one of those weekends. I can’t go through a whole loaf of bread in a week before it gets hard, so I stick it in the fridge and periodically make savory French toast to use it up. On this particular weekend, Michelle and I were hungry and for some reason I didn’t have a lot of produce in my fridge. I proposed French toast. Then I saw the block of cheese in my fridge. I can’t remember which one of us had the idea to grate the cheese and melt it on the French toast, but that is what we did. And it was delicious — comfort food at its best. Try it for yourself. Crack eggs into a bowl and add a splash of milk and pepper to taste. Soak bread slices in egg mixture and fry in oil over low-med heat. When you flip the bread, sprinkle grated cheese on the top of the slices and put the lid on the pan for a few minutes, until cheese is melted. Serve hot, dipped in ketchup. This entry was posted in food, pictures, recipes and tagged breakfast, brunch on 26.12.2011 by taplatt. 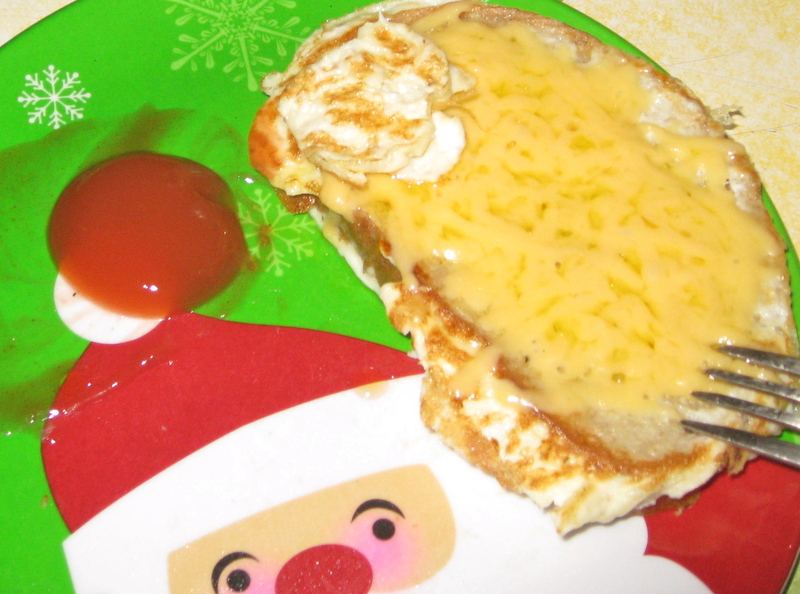 Oooh….cheese on French Toast is an excellent addition. To be honest, cheese improves pretty much everything. It’s my Achille’s Heel – I have to rein myself in sometimes, but a little grated over French Toast shouldn’t do that much harm! !